During the 60’s-70’s the environmental movement began to emerge, starting in the United States. Since then, a global concern for environmental issues has been developing through-out time. We, as graphic designers, feel the need to always keep in mind how crucial it is to consider ecological issues when designing. We feel that anyone creating art should as well. We are constantly trying to find new paths that help us develop our work in an environmentally friendly manner, and for this reason we have recently bumped into a new promotional technique that is useful for promotional purposes and at the same time takes into account all ecological issues when producing. 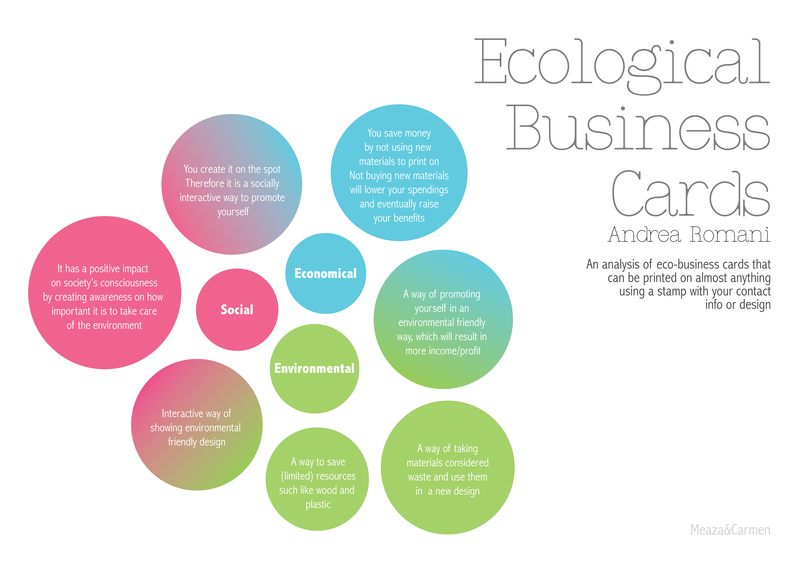 The Ecological Business Cards follows a reuse principal, giving you the chance to promote yourself anywhere, with a stamp. By creating a stamp with the information needed, printing techniques are left a side and huge new amount of paper consumption is no longer required. In order to show the importance of material awareness when it comes to designing, we are going to highlight two relevant theories that address the issue. The first one is the Waste Hierarchy, Theory of The Three R’s. The principals of this theory have become the core point of many waste minimisation strategies. The Waste Hierarchy pyramid announces several actions that should be considered when managing waste material. Almost at the top of the pyramid we can find the reuse option. It states that one of the biggest concerns when using a product or an object should be to try and maximise its use period and generate the minimum possible waste out of it. Taking into account the values it stimulates, the idea of the Ecological Business cards focuses on reducing the maximum need and consumption of paper by allowing the user to stamp on any kind of flat material e.g. piece of card board, yoghurt lid etc. 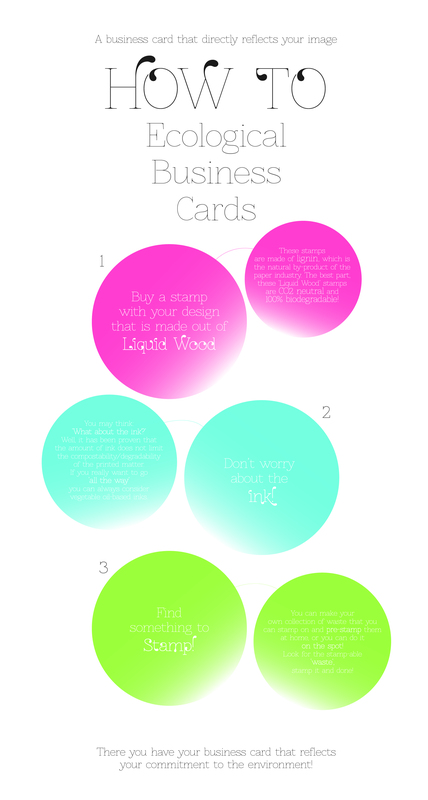 This process makes the reuse of any object possible with the above conditions, transforming it into a business card. Moving towards theories that predict a broader philosophy of life related to environmentally sustainable behaviour we bring along the core principals of Permaculture. This philosophy of life encourages the individual to fight alongside with nature instead of fighting against it. Visit their website for more detailed information about the organisation http://www.permaculture.org. 6. Produce no waste: By valuing and making use of all the resources that are available to use, nothing goes to waste. Having stated these relations it’s easy to appreciate how essential the reuse technique becomes when designing. Andrea Romani, an Italian environmental consultant, has been one of the pioneers introducing this new ecological business promotion technique. With this innovative design Andrea Romani has created a communicative self-promotion technique that reflects desired qualities by any entrepreneur. The social aspect of these ecological cards is that they have an impact on society’s consciousness creating awareness on how crucial it is to consider the environment at all times. The fact of having a stamp as the main resource/technique to promote you creates an active interaction between business and client. The economic aspects are clearly a bonus for the user; the process only requires the making of one stamp, no paper or printing consumption, which will eventually become an important raise of profit. The environmental aspect of the method allows the user to save limited natural resources like wood and plastic and at the same time it creates an ideal situation to reuse material, creating less waste. We believe ecological measurements are an essential feature of the future design outcomes and therefore we encourage everyone to continue seeking for innovative formulas that can be applied in order to maintain a peaceful relationship with the environment. Making your own promotional cards has never been this easy; follow our “Do it yourself” manual and start promoting your business in a new environmentally friendly way.